Las Vegas Sands CEO Sheldon Adelson examines a document with a magnifying glass while testifying on Friday in a senior executive's wrongful termination suit. Click here to see video from the hearing. Las Vegas — Casino mogul Sheldon Adelson took the witness stand Friday at a hearing in a wrongful termination suit brought by a former senior Las Vegas Sands Corp. executive, during which the 81-year-old billionaire CEO aggressively sparred with both the plaintiff’s attorney and the judge. “Sir, you need to answer the question,” Judge Gonzalez said sternly, according to a Courtroom View Network webcast of the proceedings. "I don't know," Adelson finally responded after examining a copy of the e-mail in question with a large magnifying class. Plaintiff Steven Jacobs, the former president of Las Vegas Sands' Macau unit, sued the company in 2010 alleging he was fired for protesting illegal activities he says were undertaken by the company, supposedly including blackmailing Macau officials and making ties with Chinese organized crime groups. Adelson’s testimony is part of a hearing to determine if Nevada’s state courts have jurisdiction over the suit, since it involves a company that operates in a foreign country. The defendants claim that Jacobs’ suit doesn’t belong in Nevada, because the company's Macau unit, known as Sands China, doesn’t operate in the state. Jacobs is seeking to recover 2.5 million Sands China stock options, according to court records. Adelson testified that Jacobs was fired due to his poor performance while running Las Vegas Sands’ Macau unit. He said that Jacobs had no experience running a company and that he had “dozens” of reasons to terminate Jacobs for cause. “He was one of the least competent and potentially destructive executives I had in over 50 companies in my 69-year business career,” Adelson testified. Adelson’s testimony, which continues Monday, dragged on at a halting pace due to his attorneys raising objections to the majority of questions asked by Pisanelli. At times Adelson pre-empted his attorneys and objected on his own behalf. “Asked and answered,” Adelson said at one point, prompting his attorney Randall Jones to then relay the objection to Judge Gonzalez for his client. “Asked and answered,” Jones repeated to the judge. Jacobs is expected to testify at the hearing later this week. The defendants are not permitted to call any witnesses on their behalf as part of sanctions imposed by Judge Gonzalez over delays in producing evidence requested by Jacobs’ attorneys. 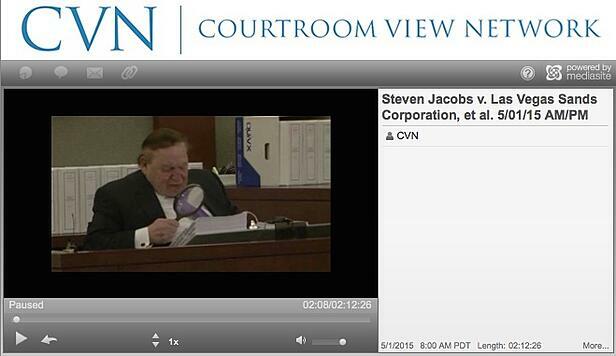 Jacobs’ suit isn’t the first case related to Las Vegas Sands’ business in Macau to land Adelson - one of the most prominent donors to Republican political candidates in the United States - in a Nevada state court witness box. In 2013 Adelson testified at a jury trial in businessman Richard Suen’s suit against Las Vegas Sands, which claimed Adelson shortchanged Suen after he helped the company obtain a key gaming license in Macau. The jury awarded Suen $101.6 million dollars, and the trial, like the current hearing, was webcast gavel-to-gavel via Courtroom View Network. Jacobs is represented by Pisanelli Bice. Adelson and Las Vegas Sands are represented by Kemp Jones & Coulthard LLP. The case is Steven Jacobs v. Las Vegas Sands Corp., case number A-10-627691-B in the Eighth District Court of Nevada for Clark County.